Sign up and receive Property Email Alerts of Garden Cottages to let in Crestholme, Hillcrest. Lavender Cottage is thatched and being refurbished to its former quaintness. Your own private gate and fenced garden brings you to this home. Double Volume Open Plan Living area and kitchen is spacious and the bathroom is plumbed for a washing machine. This area has recently been tiled. Main Bedroom is on the ground floor, newly tiled, while the second bedroom is in the loft and is carpeted. Electricity, water and garden service are included in the rent. Two outside dogs are welcome. Strictly outdoor. You will require bedroom cupboards as there are no built in cupboards and your own stove. 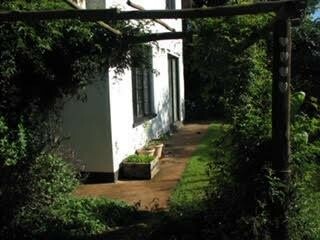 To view this cottage kindly contact Cherylin on this link. Sign-up and receive Property Email Alerts of Garden Cottages to let in Crestholme, Hillcrest.